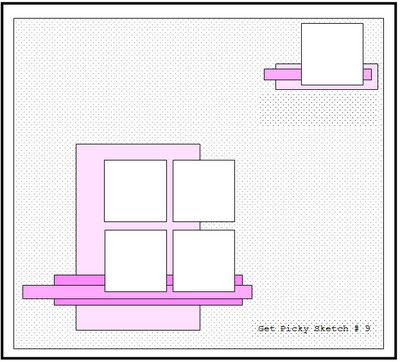 Get Picky's sketch this month had room for 5 photos ... but I squeezed in 6! :-) Here's the sketch. I used a couple of Ali Edwards stamps from her Road Trip set for my title. Saved me thinking too hard hehehe I coloured them with Twinkling H20's. And another LO done for our 2009 holiday album! I do hope I have this holiday all scrapped before the end of the year! It's taking me forever! looks good, I love how you coloured in with the twinkling H20's. what a great layout, n u managed to fit 6 pics!! Six pics match this layout! love the colouring in too! A Date & Some Donuts!